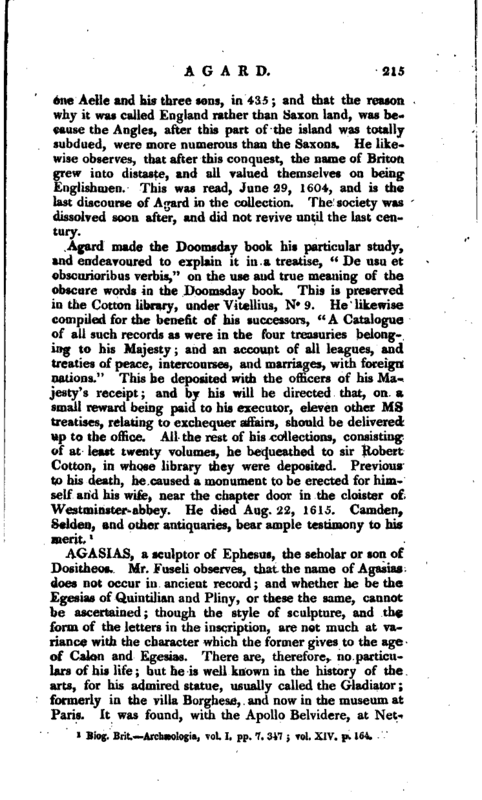 , a learned and industrious English antiquary, and one of the members of the first society of antiquaries, was the son of Clement Agard, of Foston (not Toston, as in the Biog. Brit.) in Derbyshire, by Eleanor, the daughter of Thomas Middleborough, of Egbaston in Warwickshire. He was born 1540, and originally studied law; but it does not appear that he was at either university. He afterwards became a clerk in the Exchequer office; and in 1570 was made deputy chamberlain of the Exchequer, which he held forty-five years. During this time, he had leisure and industry to accumulate large | collections of matters pertaining to the antiquities of his country; and his rseal in these researches procured him the acquaintance of that eminent benefactor to English literature and antiquities, sir Robert Cotton, with whom he enjoyed the strictest friendship as long as he lived. Wood, in his Athenae, has made a strange mistake here in ascribing Agard’s proficiency in antiquary knowledge to Sir Robert, who was but just born the year Agard came into office. There can be no doubt, however, that they improved and assisted each other in their pursuits. Agard also could number the most eminent and learned men of the age among his friends and coadjutors. 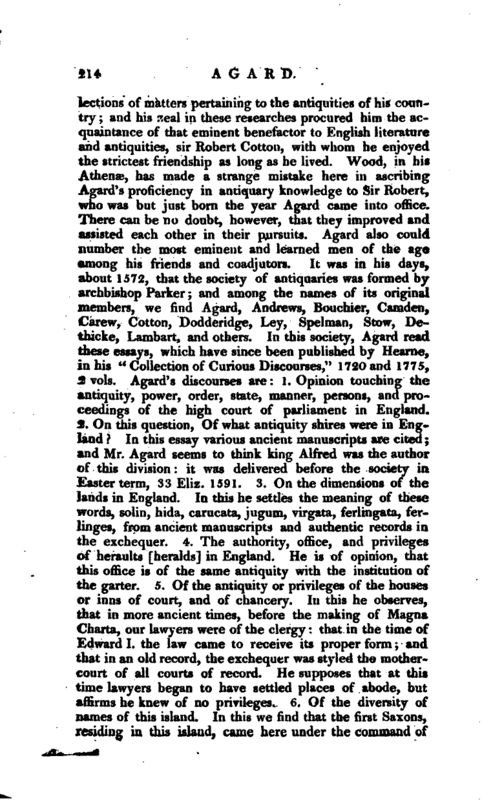 It was in his days, about 1572, that the society of antiquaries was formed by archbishop Parker; and among the names of its original members, we find Agard, Andrews, Bouchier, Camden, Carew, Cotton, Dodderidge, Ley, Spelman, Stow, Dethicke, Lambart, and others. In this society, Agard read these essays, which have since been published by Hearne, in his “Collection of Curious Discourses,” 1720 and 1775, 2. vols. Agard’s discourses are: 1. Opinion touching the antiquity, power, order, state, manner, persons, and proceedings of the high court of parliament in England. 2. On this question, Of what antiquity shires were in England In this essay various ancient manuscripts are cited; and Mr. Agard seems to think king Alfred was the author of this division: it was delivered before the society in Easter term, 33 Eliz. 1591. 3. On the dimensions of the lands in England. In this he settles the meaning of these words, solin, hida, carucata, jngum, virgata, ferlingata, ferlinges, from ancient manuscripts and authentic records in the exchequer. 4. The authority, office, and privileges of heraults [heralds] in England. He is of opinion, that this office is of the same antiquity with the institution of the garter. 5. Of the antiquity or privileges of the houses or inns of court, and of chancery. In this he observes, that in more ancient times, before the making of Magna Charta, our lawyers were of the clergy: that in the time of J^dward I. the law came to receive its proper form; and that in an old record, the exchequer was styled the mothercourt of all courts of record. He supposes that at this time lawyers began to have settled places of abode, but affirms he knew of no privileges. 6. Of the diversity of names of this island. In this we find that the first Saxons, residing in this island, came here under the command of | ne Aelle and his three sons, in 43.5; and that the reason, why it was called England rather than Saxon land, was because the Angles, after this part of the island was totally suhdued, were more numerous than the Saxons. He likewise observes, that after this conquest, the name of Briton grew into distaste, and all valued themselves on being Englishmen. 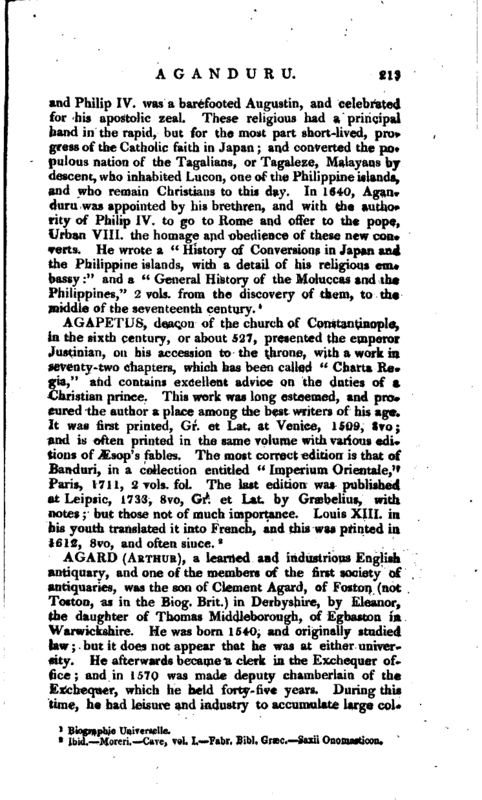 This was read, June 29, 1604, and is the last discourse of Agard in the collection. The society was dissolved soon after, and did not revive until the last century. Biog. Brit. Archæologia, vol. I. pp. 7. 347; vol. XIV. p. 164.